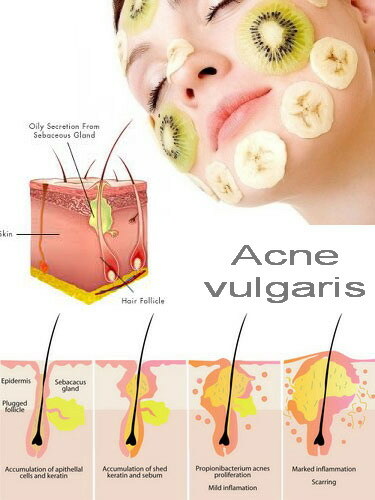 What is Acne? Acne occurs when hormones or other substances disturbs the regular or normal functions of the skins oil glands, otherwise known as sebaceous glands, and hair follicles. The disturbance leads to clog pores and outbreaks of pimples or zits. The most common places affected are the face, neck, back, chest and shoulders. Even though it's not serious as a health threat, it can cause an a lot of emotional distress and may lead to some permanent scarring. Acne develops in the pores of hair follicles when the oily substance called sebum that can normally empty onto the skin through the opening in the follicle becomes clogged. There are special cells lining the follicle called keratinocytes, that together with the hair and sebum may produce a plug, producing an early sign of acne. The plug asked to prevent the sebum from reaching the surface of the skin, and the next tier of oil and sells allow a bacteria that normally lives on the skin to grow inside the plugged follicle. White blood cells or leukocytes then rush in to fight the infection, causing the usual swelling and redness associated with the pimples. Eventually, the wall of the plugged pores, break down, spilling everything into the nearby skin cells and causing the zits. What is acne when it's called a whitehead or a blackhead? As long as the pimple is below the skin and closed its considered a whitehead, but once it reaches the surface of the skin and opens, it becomes a black head because it can look black on the skin surface. The black discoloration is due to oxidation of the sebum. Contrary to common mythology, it is not due to dirt. Both whiteheads and black heads may stay in the skin for a long time. What's the difference between a pimple and a Zit? Technically speaking, when the clogged pore is topped by a pus filled lesion, it is considered a pimple. When the pimple, or pus filled lesion is deep, it is considered a cyst. Cysts can be deep, painful and leave scarring. There are lots of names for pimples, one of those names was made popular in the 1960's, the slang term "zit". The word pimple probably originated from the Old English " pipligende" or meaning "having shingles." Shingles is the eruptions caused by the herpes zoster virus that occur along the path of a nerve.